After a career year, Jaguars defensive tackle Sen'Derrick Marks reportedly is getting richly rewarded. 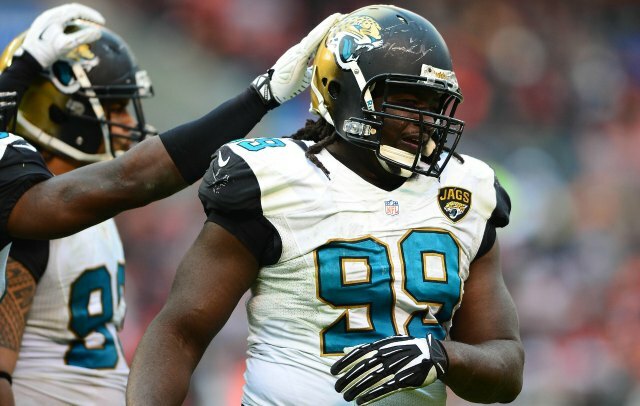 Before the season started, defensive tackle Sen'Derrick Marks signed a one-year, $1.5 million contract with the Jaguars so he could prove that he was worth a multi-year deal worth millions of a dollars. After a 2013 campaign in which he's recorded four sacks and batted down eight passes, Marks reportedly has earned exactly that, agreeing to a four-year deal worth up to $22 million, according to NFL.com. To compare, Marks spent the first four seasons of his career with the Titans. His combined statistics from 2009-12: eight broken-up passes, three sacks. This season, then, was a pretty good turnaround (according to measurements by Pro Football Focus, which ranks him as the 29th-best defensive tackle in the league, Marks also has accumulated 11 quarterback hits and 24 quarterback hurries this season). "Not many three-technique guys can do the things [Marks] does," Jacksonville linebacker Paul Posluszny said last week, via the Florida Times Union. "He's very athletic, moves really well. He has that great combination in a three-technique where he can hold up against the run and rush the passer. "He should get what he deserves [financially]. He's playing at a very high level right now. We want him here. We want him to be a piece of our defense in the future." As for why he's gotten so much better this season, Marks said, "My improvement this year is a bit of everything. The scheme is great. The guys around me allow me to make more plays because they push the pocket and make the quarterback move. I know exactly what the coaches want done. I do what I'm supposed to do."